In Defence Of STAR TREK INTO DARKNESS | Warped Factor - Words in the Key of Geek. Dr Moo boldly goes to a film that really needs a colon added to the title. It may come as a surprise to you, going by the name I write under and the content of all my prior articles, but I do actually LOVE Star Trek to bits. And while it’s not a film that’s widely liked by the fans as a whole, I also adore the first Trek-related thing I ever saw: The 2013 movie Into Darkness. So I thought it good to take a look back and see if I can defend it and present exactly why it’s not as bad as some would have you believe. One of the film’s most common criticisms come from the plot being a rip-off of what’s possibly the franchise’s finest instalments, The Wrath Of Khan, so I thought I’d start by taking a quick overview of that plot. 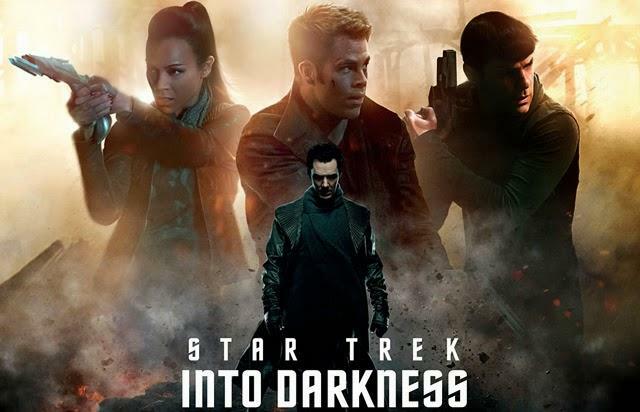 Into Darkness opens on an alien world where Kirk saves Spock’s life (that’s significant so remember that) even though in doing so he violates the Prime Directive. For this he is stripped of the rank of captain, with command of the Enterprise reverting to Christopher Pike and Kirk demoted to his second-in-command. But, after Pike is killed in a terrorist attack by John Harrison, Kirk is back in charge. The plot soon has Starfleet’s Admiral Marcus sending the Kirk and the Enterprise to apprehend Harrison who is hiding somewhere in the Klingon Empire. 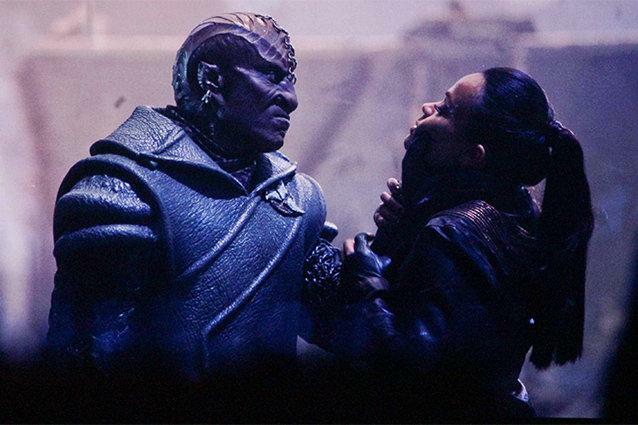 It’s good to see Klingons done with a decent budget. Harrison surrenders after learning of the torpedoes that Marcus has put in the Enterprise and is imprisoned, but before long we get an infamous twist reveal that Harrison is just a fake name given to him by the-now-revealed-to-be-a-traitor Marcus, and Harrison is in fact the genetically engineered superhuman Khan. The torpedoes contained his fellow superhumans and Marcus was using them as leverage, playing Khan, Kirk and everyone else in the hope of starting a war with the Klingons. Marcus gets some comeuppance when Khan brutally murders him, before also critically damaging the Enterprise forcing Kirk to die whilst stopping the ship from crashing. 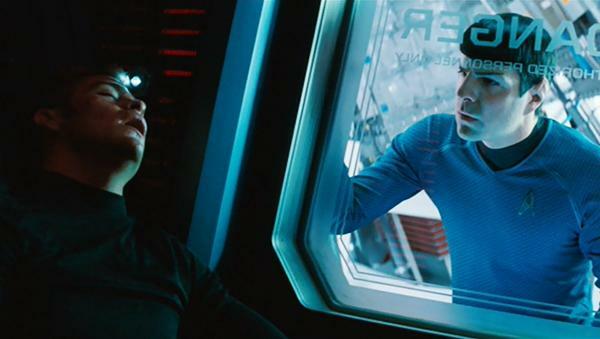 Spock watches helplessly (note how the narrative has come round circularly), but eventually he and Uhura capture Khan and Bones uses his superblood to make a serum riving Kirk. They then set off on the iconic “five year mission”. The plot is often criticised for being similar to The Wrath Of Khan and to Space Seed. I however will defend that aspect of things. Yes Into Darkness just happens to contain elements from both but the events play out differently. For one thing, Kirk dies instead of Spock. Khan is woken up by someone different at an earlier point. There’s a whole sequence of ship on ship attacks whilst they’re both using their warpdrives. And everything with Scotty and the introduction of a corrupt Starfleet Admiral are also new additions. So while the plot is similar to the prior Khan stories from The Original Series it’s also different enough to justify itself. It even has Spock Prime (played by the wonderful Leonard Nimoy may he rest in peace) calling it out on that. But then there’s the contentious issue of Khan’s casting. Originally he was played by Mexican actor Ricardo Montalbán but now he’s white Brit Benedict Cumberbatch (of Sherlock fame). Presumably the filmmakers were relying upon the star power he offers in hope of getting non-Trekkies to watch the movie as well? This choice of casting is often met with criticism for two reasons. Firstly, the filmmakers attempted to hide John Harrison’s identity (even outright denying that Khan was involved in the movie) however fans saw right through from almost the moment Cumberbatch was cast. But the bigger issue is that of race. Switching the character’s actor is acceptable given the circumstances and it has worked nicely for the rebooted Trek canon – Chris Pine as Kirk, Zachary Quinto as Spock, Simon Pegg as Scotty, and so on – but there’s only so far you can go with it. None of these characters have been whitewashed from a man of colour to a white man, but with Khan that’s exactly what they did. This is a tricky point to defend due to the sensitive nature of the potentially racist goings on, but hear me out. Look at the other major villain of the movie, Admiral Marcus. The fact he’s a villain is a shock on first viewing because you don’t expect it. Normally if a Starfleet Admiral is taking on the villain role it’s because of some kind of misunderstanding or because there’s a giant bug inside them or something. Not so here. The point is that this is a man who is evil despite everything, he turns on the people he works for but he does it in secret. Starfleet are searching hard for the man who launched a terrorist attack on them, when the truth is he was one of their own all along. So maybe having Khan, in this timeline, as a white British man who looks like Sherlock Holmes makes sense from a thematic perspective? The movie makes a point that we can get too caught up in looking for something to target hate and anger at outside our own background that we miss another one that’s right there under our noses! It’s one we could do well to hear today in 2017, during what will go down in history as Trump Year One. 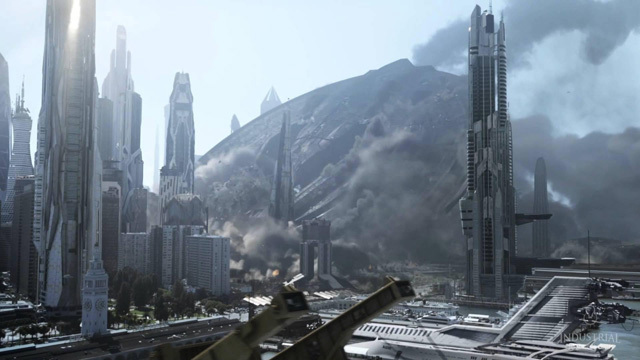 One final critiscim I want to address is the way everything is so overblown here, look no further than this final setpiece as a starship smashes through San Fransisco to see what the critique refers to. That’s a fair complaint but you can’t single out this movie for that, compared to most blockbusters nowadays Into Darkness is tame. J J Abrams is making a major blockbuster so he gives the audiences thrills and action. Trek movies, like the TV shows that they’re spun-off from, are traditionally more cerebral character-focused affairs so to have one movie that doesn’t go that way – the twelfth movie in the series – and for it to go in a different direction may not be refreshing for the movie industry but it sure is for Trek (just don’t let it become the norm). Thankfully we got Star Trek Beyond a few years later, which managed to find a nice blend of both. Whether or not Star Trek Into Darkness (it really needs a colon in that title) is a good movie is not a question at all, the answer is obviously yes. Whether or not it’s a good Star Trek movie is another matter, but I think that’s asking the wrong question. It took a series that was then 47 years old and a film that was then 31 years old and did something new with them. It asks a tricky question about our modern culture’s tendency to point blame at “The Other” and shows us that doing so can lead to disaster. Into Darkness may not be the best Trek movie, or even in the top half of most people’s rankings, but I think it deserves some more appreciation then it gets for what it tries to do.